We are only six months into the Bank of England’s new regime of giving forward guidance about what circumstances might lead them to adjust the Base Rate and they are already in a bit of a mess with it. Whether forward guidance is abandoned or not is still in the balance, amid much confusion. 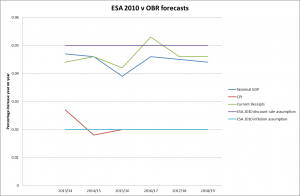 However, much of this confusion seems to be due to the challenge that events have provided to the assumption that the Bank of England could make reasonably accurate economic predictions. It turns out that not only did the Bank not know how fast unemployment would fall (not a surprise: the Monetary Policy Committee (MPC) minutes from August make clear that they suspected this might be the case), but neither did they know, when it did fall, what a 7% unemployed economy would look like. The Bank has been very surprised by how fragile it still is. Back in August 2013, when unemployment was still at 7.7%, the MPC voted to embrace the forward guidance which has now fallen on its face. This said that: In particular, the MPC intends not to raise Bank Rate from its current level of 0.5% at least until the Labour Force Survey headline measure of the unemployment rate has fallen to a threshold of 7%, subject to the conditions below. 3. the Financial Policy Committee (FPC) judged monetary policy posed “a significant threat to financial stability”. More difficult to give an opinion on that one but, looking beyond the incipient housing market bubble, it is difficult to see that monetary policy is causing any other instability currently. Certainly not compared to the instability which would be caused by jacking up interest rates and sending mortgage defaults through the roof. So it seems that there has been no clear knock out on any of these three counts, but that the “threshold” (it was never a target after all) of 7% is no longer seen as significant a sign of economic recovery as it had been believed it would only last August. Fun as it is to watch the illusion of mastery of the economy by the very serious people flounder yet again, as what is an intrinsically good piece of economic news is turned into a fiasco of indecision, I think the Bank is right to believe that it is far too early to raise interest rates. I say so because of two further graphs from the Office of National Statistics (ONS) latest labour market statistics, which were not included in their infographic on the left. 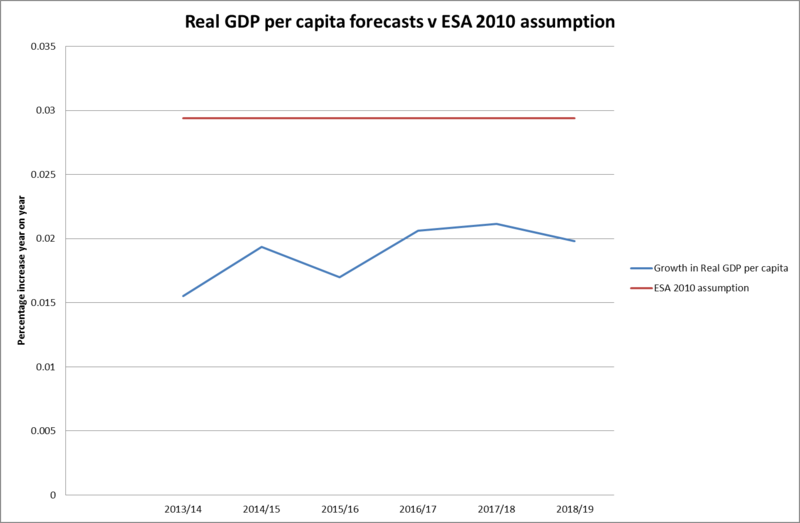 The first is the graph of regional unemployment, which shows very clearly that large areas of the UK are still nowhere near the magic 7% threshold: the variations are so wide and, in austerian times, the resources to address them are so limited that it makes sense not to be overly dazzled by the overall UK number. The second is the graph of those not looking or not available for work in the 16-64 age group since the 1970s. As you can see, it has recently shown a very different pattern to that of the unemployment graph. In the past (and borne out by the data from 1973 to around 1993) the number not available to work has tended to mirror the unemployment rate as people who could manage without work withdrew from the job market when times got tough and came back in when things picked up. However in the early 90s something new started to happen: people withdrawing from the job market even when unemployment was falling. There has been a steady increase in their number until it finally started to fall only last year. So what is happening? One of the factors has been a big increase in the number of people registered as self employed, rising from 4.2 million in 1999 to 5.1 million in 2011. However, many of these people are earning very little and I suspect that at least some of them would have been categorised as unemployed in previous decades. There must therefore be some doubt about whether 7% unemployed means what it used to mean. The Bank of England have shown with their difficulties over forward guidance that it is very hard to look forward with any degree of precision. It should be applauded for admitting that it doesn’t know enough at the moment to start pushing up interest rates. There has been the usual flurry of misleading headlines around the Prime Minister’s pledge to maintain the so-called triple lock in place for the 2015-20 Parliament. The Daily Mail described it as a “bumper £1,000 a year rise”. Section 150A of the Social Security Administration Act 1992, as amended in 2010, already requires the Secretary of State to uprate the amount of the Basic State Pension (and the Standard Minimum Guarantee in Pension Credit) at least in line with the increase in the general level of earnings every year, so the “bumper” rise would only be as a result of earnings growth continuing to grind along at its current negative real rate. 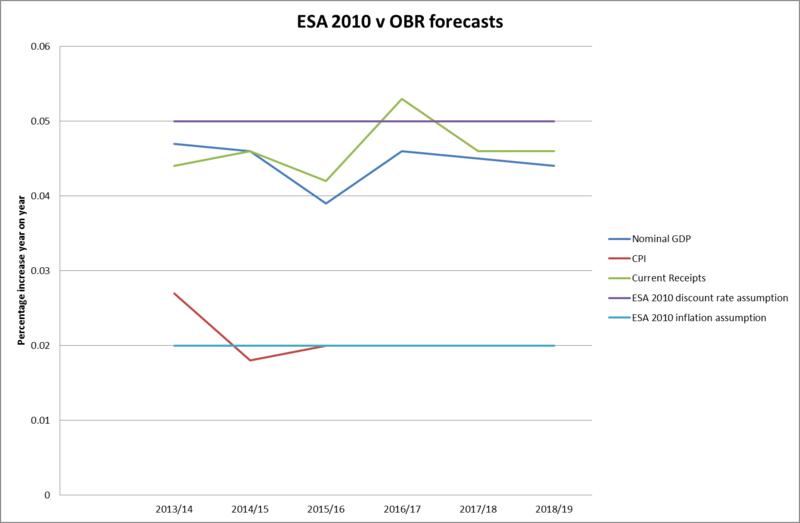 The OBR have of course not got a great track record on predicting such things, but all the same I was curious about where the Daily Mail’s number could have come from. The Pensions Policy Institute’s (PPI’s) report on the impact of abandoning the triple lock in favour of just a link to earnings growth estimates the difference in pension in today’s money could be £20 per week, which might be the source of the Daily Mail figure, but not until 2065! I think if we maintain a consistent State Pensions policy for over 50 years into the future a rise of £20 per week in its level will be the least remarkable thing about it. The PPI’s assumption is that the triple lock, as opposed to what is statutorily required, would make a difference to the State Pension increase of 0.26% a year on average. It is a measure of how small our politics has become that this should be headline news for several days. It’s a relatively new science, and one which binds together many different academic disciplines: mathematical modelling, economics, sociology and history. In economic terms, it is to what economists in financial institutions spend most of their time focusing on – the short to medium term – as climate science is to weather forecasting. Cliodynamics (from Clio, the Ancient Greek muse or goddess of history (or, sometimes, lyre playing) and dynamics, the study of processes of change with time) looks at the functioning and dynamics of historical societies, ie societies for which the historical data exists to allow analysis. And that includes our own. Peter Turchin, professor of ecology and mathematics at the University of Connecticut and Editor-in-Chief of Cliodynamics: The Journal of Theoretical and Mathematical History, wrote a book with Sergey Nefedev in 2009 called Secular Cycles. In it they took the ratio of the net wealth of the median US household to the largest fortune in the US (the Phillips Curve) to get a rough estimate of wealth inequality in the US from 1800 to the present. The graph of this analysis shows that the level of inequality in the US measured in this way peaked in World War 1 before falling steadily until 1980 when Reagan became US President, after which it has been rising equally steadily. By 2000,inequality was at levels last seen in the mid 50s, and it has continued to increase markedly since then. The other side of Turchin’s and Nefedev’s analysis combines four measures of wellbeing: economic (the fraction of economic growth that is paid to workers as wages), health (life expectancy and the average height of native-born population) and social optimism (average age of first marriage). This seems to me to be a slightly flaky way of measuring this, particularly if using this measure to draw conclusions about recent history: the link between average heights in the US and other health indicators are not fully understood, and there are a lot of possible explanations for later marriages (eg greater economic opportunities for women) which would not support it as a measure of reduced optimism. However, it does give a curve which looks remarkably like a mirror image of the Phillips Curve. The Office of National Statistics (ONS) are currently developing their own measure of national well-being for the UK, which has dropped both height and late marriage as indicators, but unfortunately has expanded to cover 40 indicators organised into 10 areas. The interactive graphic is embedded below. I don’t think many would argue with many of these constituents except that any model should only be as complicated as it needs to be. The weightings will be very important. Putting all of this together, Turchin argues that societies can only tolerate a certain level of inequality before they start finding more cooperative ways of governing and cites examples from the end of the Roman civil wars (first century BC) onwards. He believes the current patterns in the US point towards such a turning point around 2020, with extreme social upheaval a strong possibility. I am unconvinced that time is that short based solely on societal inequality: in my view further aggravating factors will be required, which resource depletion in several key areas may provide later in the century. But Turchin’s analysis of 20th century change in the US is certainly coherent, with many connections I had not made before. What is clear is that social change can happen very quickly at times and an economic-political system that cannot adapt equally quickly is likely to end up in trouble. And in the UK? Inequality is certainly increasing, by pretty much any measure. And, as Richard Murphy points out, our tax system appears to encourage this more than is often realised. Cliodynamics seems to me to be an important area for further research in the UK. And a perfect one for actuaries to get involved in. There’s certainly a great deal of uncertainty about. In Nate Silver’s book, The Signal and the Noise, there is a chapter on climate change (which has come in for some criticism – see Michael Mann’s blog on this) which contains a diagram on uncertainty supposedly sketched for him on a cocktail napkin by Gavin Schmidt. It occurred to me that this pattern of uncertainty at different timescales was more generally applicable (it describes very well, for instance, the different types of uncertainty in any projections of future mortality rates). In particular, I think it provides a good framework for considering the current arguments about economic growth, debt and austerity. Some of these arguments look to be at cross-purposes because they are focused on different timeframes. 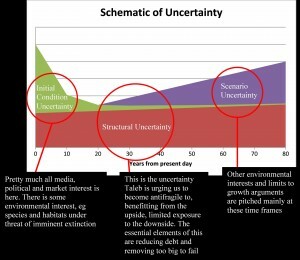 In the short term, looking less than 10 years ahead, initial condition uncertainty dominates. This means that in the short term we do not really understand what is currently going on (all our knowledge is to some extent historical) and trends which might seem obvious in a few years are anything but now. Politics operates in this sphere (long term thinking tends to look two parliaments ahead at most, ie 10 years). However, the market traders who by their activities move the markets and market indices on which we tend to base our forecasts and our economic policies are also working in the short term, the very short term (ie less than 3 months to close off a position and be able to compare your performance with your peers), even if they are trading in long term investments. So both the politics and economics is very short term in its focus, and this is therefore where the debate about growth and austerity tends to be waged. 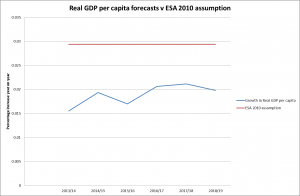 The Austerians (which include the UK Government) claim to believe that debt deters growth, and that cutting spending in real terms is the only possible Plan A policy option. The Keynesians believe that, in a recession, and when interest rates cannot go any lower, demand can only be revived by Government spending. This argument is now well rehearsed, and is in my view shifting towards the Keynesians, but in the meantime austerian policies (with all the economic destruction they inevitably cause) continue in the UK. However, there are other groups seemingly supportive of the UK Government’s position in this argument for altogether different reasons. Nassim Nicholas Taleb argues that high levels of debt increase an economy’s fragility to the inevitable large devastating economic events which will happen in the future and which we cannot predict in advance. He therefore dismisses the Keynesians as fragilistas, ie people who transfer more fragility onto the rest of us by their influence on policy. These concerns are focused on the structural uncertainty which is always with us and is difficult to reduce significantly. It is therefore important to reduce (or, if possible, reverse) your fragility to it. At the longer term end are the groups who believe that we need to restrict future economic growth voluntarily before it is done for us, catastrophically rapidly, by a planet whose limits in many areas may now be very close to being reached. They are therefore implacably opposed to any policy which aims to promote economic growth. These concerns are focused where there are many possible future scenarios (ie scenario uncertainty), some of which involve apocalyptic levels of resource depletion and land degradation. These different groups are tackling different problems. I do not believe that those concerned with the structural fragility of the economy really believe that the people paying for the restructure should be the disabled or those on minimum wage. Similarly, there is a big difference between encouraging people to consume less and move to more sustainable lifestyles and recalibrating down what is meant by a subsistence level of existence for those already there. We do need to worry about too big to fail. Our economy houses too many institutions which appear to be too large to regulate effectively. We do need to reduce levels of debt when economic activity has returned to more normal levels. We will need to restructure our economy entirely for it to make long-term sense in a world where long term limits to growth seem inevitable. But none of these are our immediate concern. We need to save the economy first.